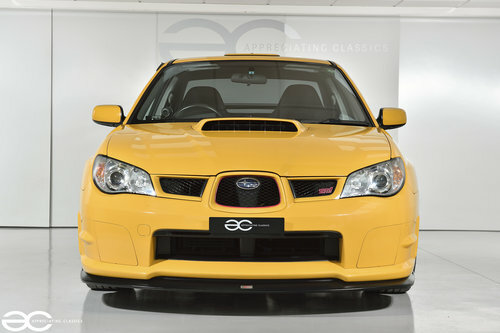 Welcome to our stunning Yellow Subaru Impreza WRX STi Spec C Type RA-R…..
With only 300 of this variant produced, they are certainly among the rarest of Subaru Impreza’s. 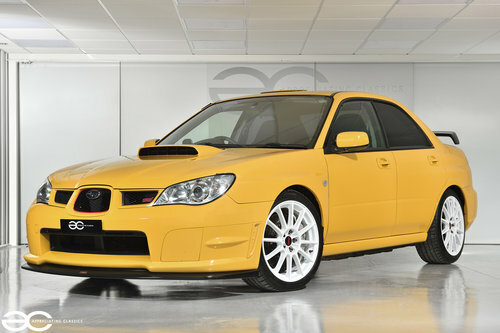 Not only this, but it is the rarest of the colours that were produced, with only 50 sport yellow RA-R’s being made in total. 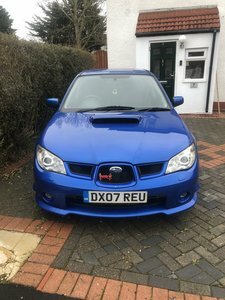 With a vast amount of performance upgrades over a standard WRX STi, the RA-R is one of the most sought after ‘modern day’ Subaru’s and this example is really a cut above the usual example’s. The 2.0-litre Turbocharged engine came fully blueprinted, and with the use of a twin-scroll turbo, revised intake, new exhaust and more aggressive camshafts, they produce a very impressive 320ps (316bhp). Add to this the fact they are 70kg’s lighter than a standard WRX STi, and with braking being taken care of by the huge Brembo six piston calipers with two piece front discs, they are just spectacular to drive. Having spent the majority of its life in Japan, the underside condition is as you would expect – fantastic. Exported from Japan on the 29th of January 2018. Still yet to be registered, so that the purchaser can be the first UK registered owner of this example. Since arriving in the UK, the car has had various works to ensure it is ready to be enjoyed by the new owner. 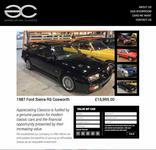 This of course includes a cambelt service plus much more, details of which can be read through the listing below. With full Japanese service history, the low mileage is verified, along with the mileage data on the Japanese HPI report. 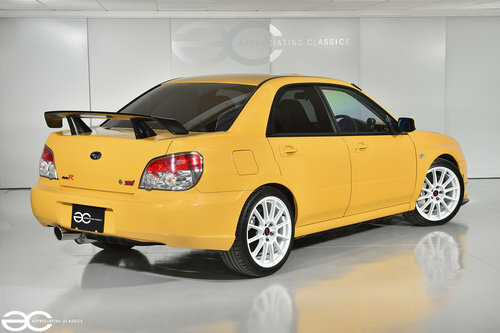 With only 50 of the Spec C Type RA-R models finished in the Yellow, this is a rare car indeed. Upon arrival to ourselves we had the paintwork on this vehicle fully machine polished to make it really look its best - it looks simply stunning! None of the usual swirly or dull paint here, it really does look fantastic! 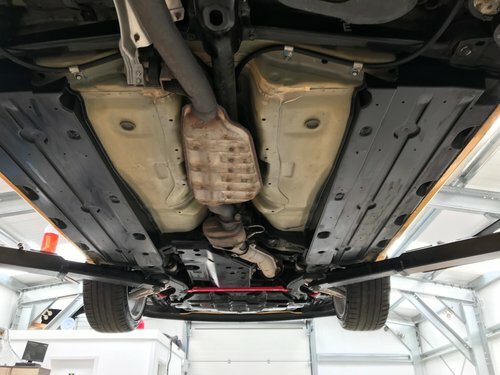 Obviously being a fresh Japanese import, the car is without any corrosion issues – and we have had the car on our ramp to clean the underside, which looks great. The box sections have all been cavity waxed as well, we decided against applying any black underseal to the underside as the chassis is too good to cover up – we can apply clear Dinitrol sealant at an extra cost. All glass is in good condition, as are the original lights and badges. The Japanese HPI verifies that this vehicle has not been subject to any accident damage whilst in Japan, so as you would expect, alignment of all panels is as per factory fitment. As you would expect, the interior is in superb condition throughout. The original steering wheel and gearknob are in great order with very minimal wear, as are the seats. The carpets are without any damage, and the original Subaru floormats are also still present. An Alpine headunit has been fitted at some stage, which although is Japanese, it can still be linked to your phone and all speakers work well. Two Defi gauges have been fitted, one of which read’s in MPH which is a nice addition, as the car has been left in KM’s for originality purposes. These two gauges could easily be removed, and they have been attached via foam tape – so no nasty screws in the dashboard! Everything works just as it should do, and the roof flap/vent does not leak. The engine runs perfectly as you would expect, and has just had a service carried out which included a cambelt change. A cold start confirms that this is a nice quiet engine, with no unwanted noises either when cold or hot. Likewise, on the road the car performs just as it should do, with a smooth power delivery throughout the rev range. No smoking at all, either on start up, on boost or on overrun. With the improvements to the RA-R over various other models, and the obvious increase in power – the car really is brilliant to drive, it also gives a fantastic noise, very different to the usual ‘Subaru noise’. Any inspection welcome, a brilliantly fun vehicle which really is a true drivers car. The engine bay itself presents very well indeed, exactly as you would expect from a low mileage and cared for example. The only none original item being the Forge dump valve. As mentioned previously in this advert, we have had the vehicle on our ramp and we have cleaned the underside of the vehicle, this includes wheels off and cleaning the wheel arches. It would be very fair to say that the underside is in great condition throughout, with no corrosion issues whatsoever! All the runing gear is also in great condition, and was cleaned. All box sections of the chassis have been cavity waxed to ensure that the condition remains the same for many years to come. We can offer a clear underseal treatment for an extra cost if a prospective buyer would so wish. The wheels and calipers look superb and are in great condition, with new Michelin Pilot sport 4 tyres fitted. As you would expect, the car drives great and the six piston Brembo calipers perform superbly. Other than KYB coilover suspension (the car is now supplied with brand new original suspension struts) , and braided brake lines, the car is without modification to the running gear. 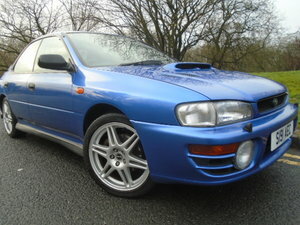 2000 Subaru Impreza P1, Engine rebuild, 23 services.